Allens Redskin Sticks are a classic Australian Lolly. A rather chewy raspberry flavour stick that also has an individual wrapper. There are 10 Redskins Sticks in a 100g pack and 64 in a 800g pack. I have many fond memories of eating these as a kid with my cousins. They are also on the Nestle gluten free list. 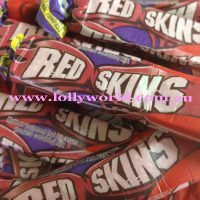 Allens Redskin Sticks are a classic Australian Lolly. A rather chewy raspberry flavour stick that also has an individual wrapper. There are 10 Redskins Sticks in a 100g pack and 64 in a 800g pack. I have many fond memories of eating these as a kid with my cousins.